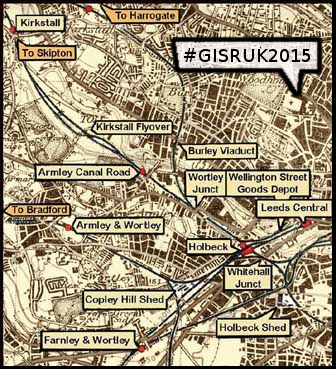 We’re hosting the next GISRUK conference (#GISRUK2015) in Leeds and have just published the call for papers. For more info see the GISRUK2015 website or follow @GISRUK on Twitter. **Aims **We welcome colleagues to the 23rd GIS Research UK (GISRUK) conference. The GISRUK conference series is the UK’s national GIS research conference, established in 1993. GISRUK conferences attract delegates from all parts of the UK, together with the European Union and North America and from disciplines including Geography, Computer Science, Planning, Archaeology, Geology, Geomatics and Engineering. #GISRUK2015 will be hosted by the University of Leeds’ School of Geography in the Faculty of Environment. The conference will take place on the 15th - 17th April 2015. If you are unsure about the relevance of your paper, please contact the conference chair ( n.malleson06@leeds.ac.uk ). ** Abstract Submission **We invite submission of extended abstracts (up to 1500 words). All abstracts will be peer reviewed; accepted abstracts will be published in the conference proceedings and some will have the opportunity to be written up as full papers and submitted to a special issue of Applied Spatial Analysis and Policy. Papers must include a short abstract (up to 100 words) and up to 5 keywords or phrases. ** These must be copied into the ‘Abstract’ and ‘Keywords’ boxes in EasyChair** .